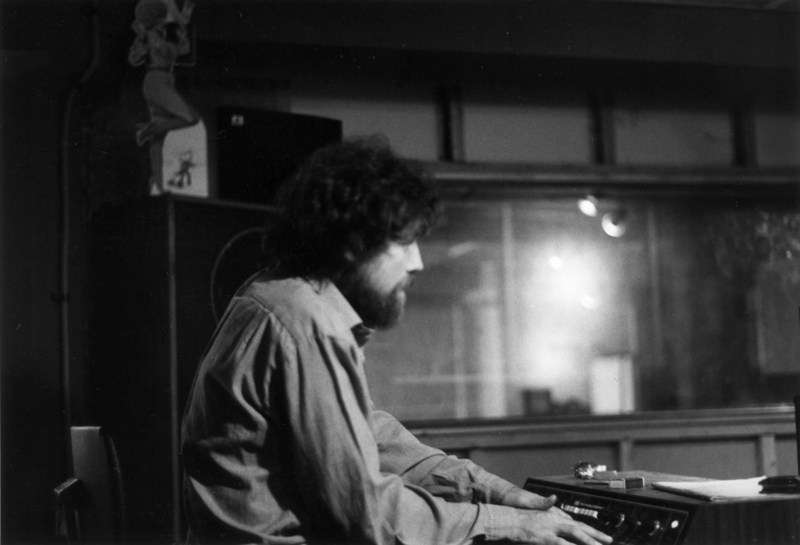 This is the first part of an interview I conducted with singer/songwriter Bill Fay back in January 2010. Interviews with the man himself are about as rare as his albums and he spoke to me on the basis that we would talk simply about our ‘feel for music’. I was, of course, happy to oblige and spent the best part of two days putting together questions that would not appear crass or invasive in the face of the work he has produced. They were questions, ultimately, that prompted two hours and a half of conversation, the first chunk of which appears below. By ways of further introduction, I have added an unused paragraph from the article I wrote, based on this interview, for Flux Magazine. 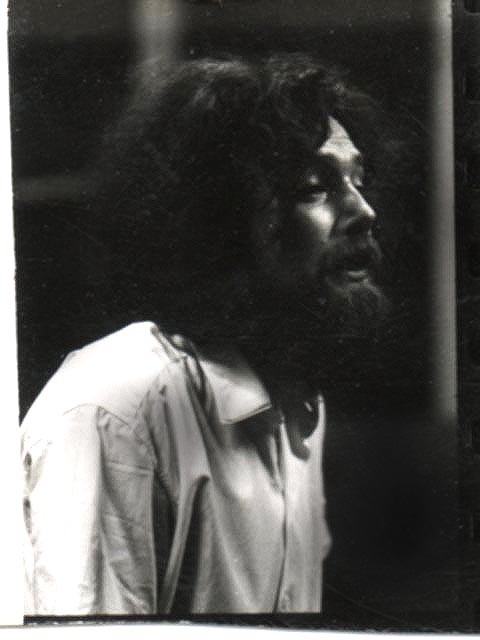 Bill Fay has been dubbed ‘Britain’s musical Salinger’ and is arguably one of the country’s most criminally undervalued songwriters, releasing two albums, ‘Bill Fay’ and ‘Time of the Last Persecution’, for Decca in the 1970’s and then disappearing from the music landscape after the label rashly dropped him. An aura of mystery has been placed around him by the music press, but his absence from the scene has been forced rather than purposely maintained. 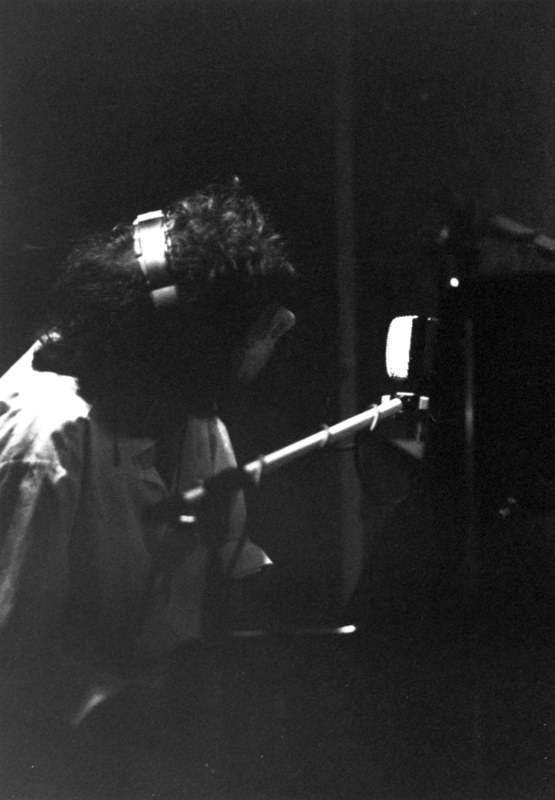 He has written and recorded all his life but the will of record companies to put out his work has not always been there, forcing him to pursue a number of half hearted second jobs. After years of neglect, his music has recently undergone a quiet resurgence, led by the likes of Wilco and Jim o’ Rourke. But it is a resurgence not for mystery’s sake. Instead it is born out of a warm regard for an under-appreciated talent and in response, he has just issued a new album of home-made and archival recordings. In a music world that already has its anointed heroes, its empty vessels and comfortable old shoes, it is always a wonder to find a man existing outside the system, who thinks what he wants to think, feels what he wants to feel and sings those thoughts in turn. Your music has always been about returning to nature and beauty, “planting myself in the garden”, as you sing during Garden Song, a regression to simplicity. This certainly seems still to be the case on the new record. Are beauty and nature and our relationship with them things which still inspire you? Underneath the lyrics of Garden Song is an enormous amount of which I will try to convey a little, although I will only really scratch the surface. Garden Song was the beginning of seeking something deeper. I had a friend I worked with, we were both very like-minded, so we would look into this and look into that. We both began to feel after all sorts of long talks, which I’m sure all sorts of people were doing at the same time, there was kind of a quest thing going on back in the 1960’s, a lot of searching for answers. Anyway, we came to feel that we were largely in our day-to-day lives asleep to a greater reality. I believed there was something to find out, but more than that, I felt strongly that you could actually find out, which was a big step for me. We felt that we as human beings had named things like a tree or a butterfly and in the act of naming them had, in a way, explained them away. Basically we felt that we were living in one sense within the restrictions of our own heads. So I started to pay more attention to nature, I didn’t run to the mountains or something though, I mean, from say the top deck of a double-decker bus, just looking at things, looking at trees. Part of your head is saying “why are you doing this, it’s only a tree!” But I kept looking in an attempt to get outside of my own head. So Garden Song kind of represents what I was doing at that time in my life. How did you channel this thought process into your song writing? What used to happen back then and to some degree still happens is that a song is a vehicle, a means of expressing where you are at inside. So with something like “I’m planting myself in the garden,” what I was trying to say is, that I’m going to look at things, I want to be a part of things in a real way and I’m going to persevere, “I’m going to wait until I know there’s a moment, to get up from my chair by the sea and I’ll be able to say that I’ve been there.” That I’m going to end up feeling things in a much more real way. As I say in Garden Song again “I’ll wait for the rain to anoint me and the frost to awaken my soul.” It was that waking up which was important to me, to connect with the real world around us of living things. I’ve only really scratched the surface there, the questions are so deep. I did come to feel an enormous, sort of, strangeness, the connection that I began to feel with the living world was very vivid. Parts of your work I always feel are very English, I suppose a long gone England, I think of that when I listen to a song like Goodnight Stan when you sing “If you can take a watering can to protect yourself.” It’s full of an old English sensibility, almost modernist parlour songs, amazing things happening in grim 1970’s suburbia, would you agree? Was that England an influence on you? Or did you look further back for the roots of your songs? Well my grandad wrote songs on the guitar, old music hall type songs and all my mum’s side of the family sang or played a musical instrument. They actually used to sing, you mentioned the world parlour, but they used to have a Sunday afternoon get together and they used to sing and play. The songs they would have sung would have been old parlour songs. Alongside all this heaviness and complexity, to do with the first album, I have always been grounded in the 1914 generation. I remember my old Aunt May and her sister looking after my Uncle Will after he was poisoned by mustard gas in the First World War, he used to just sit there all day in a chair and they used to look after him. “Sing Us One of Your Songs May” is loosely based on that. She would sing the old songs like ‘Sunshine Of Your Smile’ and I would play the piano. She never married and May and her sister went through life looking after their mum, their dad and their brother. It was another generation, which was just not confronted with the same things I was in the 60’s but I felt amazingly linked to them. I would say that I don’t particularly think England is an influence though; it could be anywhere, old America, old Ireland, anywhere older and simpler. So you were not influenced particularly by old English culture, it was just a want for a simpler time? Yes, although there is a kind of Englishness about Stan and May and myself, that North London kind of thing, these songs could still be taking place anywhere. I think one of the most effective pieces on the new album is City of Dreams, is that a critique of 21st century England? Do you still want to use your work to make a political point, or is that something you want to avoid? I’m thinking particularly about a song like War Machine, which again features on the new album. Again I couldn’t really say it was England based, the song could be based anywhere, could be Dubai or New York, it could be the City of London or more pertinently the Stock Exchange. I think the City is quite an unnatural place, scary almost, all those thousands of windows with people plugged into television screens and telephones. The song I suppose goes back to preoccupation again, man distracted from the natural world by the myriad of technical and financial developments. So would you say your songs are written more from a spiritual angle than a political one, do you avoid politics? Well the songs can be political sometimes too, just think of The Sun is Bored and “The minister for good taste”. There is a political aspect sometimes. I am sure that there are good politicians, I do remember fondly the old Labour politicians like Manny Shinwell and people of his ilk who said they wanted to bring about heaven on Earth, but it was as much as they could do to prevent hell on Earth. I could say a lot politically, I have a lot of political anger, but I do understand that a lot of the issues that politicians have to deal with are very complex. It was again based around a lot of different ideas and thoughts. I feel that Hitler did the worse thing in recent times, apart from all the evil he did, he created the concept of a ‘just war’. He had to be stopped, which is the excuse that has been used to cover all the wars since. Therefore the war machine is perpetual, because there is always, or so we are told, somebody who needs to be stopped at any cost. I feel particularly angry about that. I feel Bush and Blair established that a democracy can be a democratically elected dictatorship. There’s a melancholy feel to your work, it’s not a depressing feel, but it is down hearted sometimes, yet there is always optimism to be found somewhere, “You’re going to find your way through” in Cosmic Boxer for example, or Be Not So Fearful and Solace Flies In. Are you an optimistic person? Does a song have to have an element of optimism somewhere in it? One of the hardest things for me with Time of the Last Persecution, well, it was almost like something was breathing over your shoulder, you had to tell it like it was. You wanted to be comforting to a degree and there were still lines like “Don’t let anyone get you down”. But I had to get across this idea of the culmination of evil and all the bad things that happen in the world. It’s good to have an element of optimism in there too though and I hope people find hope within the music. I know that Marc Almond likes Cosmic Boxer for example, he see’s something of himself in the song I suppose, something in that notion of boxing on no matter what your troubles. So yes, I would say I was an optimistic person and I do try to bring that into the songs, which like you say can also be melancholy, perhaps that mix is what makes the songs more real. 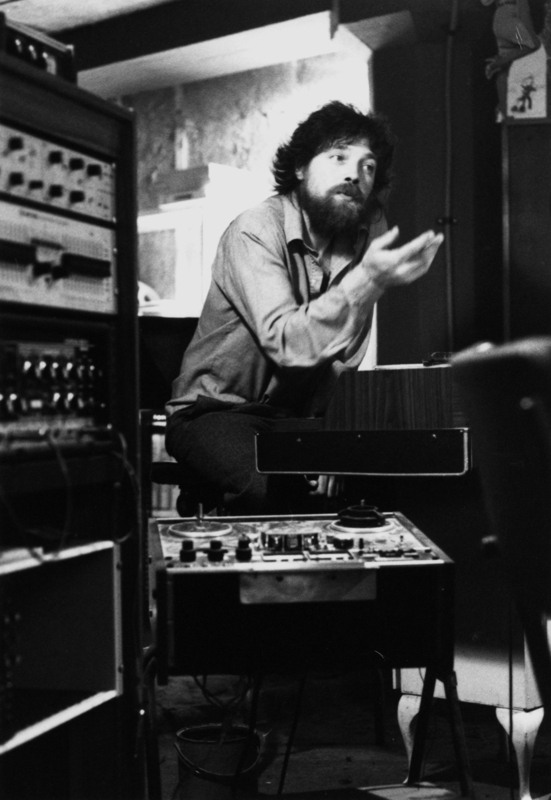 Labels do not really tend to experiment with the artists they sign today, particularly the bigger labels; do you think you would have been afforded the same chance to record today? It was all chance. I will always write songs like I do because I’m not bound by anything. Back then Decca didn’t really know what was going on, they had turned down The Beatles, something which I think made them extremely nervous. I don’t think they understood the times, the late 60’s, when so much was going on. So they just threw as much mud at the wall as possible in the hope that something would stick. So I got the chance, through Terry Noon, to be one of the pieces to be thrown against the wall and I was one of the pieces that dropped off pretty quickly as well. But within that, because Terry was such a freedom giving person and because Decca let it roll on, I had total freedom and was able to write the kind of things we began by taking about. This is a very family orientated record, you feature a song recorded by your brother and some of his artwork. Pictures of your parents feature on the inside of the cover and of course there is the lovely song Diamond Studded Days. You talk about your Dad buying you your first record player too, is this a thank you to family for the influence they have had upon you? Your writing also suggests your childhood is a time in your life you look back on with great happiness? It is very much a thank you to family. It’s a tribute to mum and dad and a massive thank you. They gave me such a lot. And yes Diamond Studded Days is my tribute to them too. 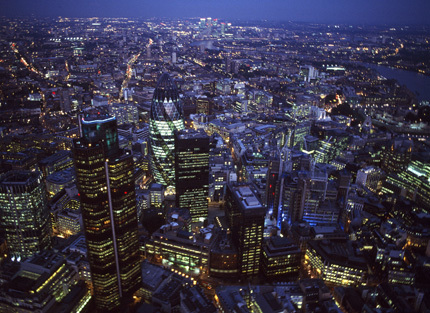 I was very fortunate to grow up where I did, although it was North London, it was on the edges, so the countryside was not that far away, I remember my Dad taking me and my brother on walks to the forest, or I’d be off on my bike, at the same time you could just as easily get a train and go into London. There was lots of unused land in those days too, lots of open spaces, which have been developed now of course, but those open spaces were great for a child’s imagination and you could kind of extend yourself within that environment. Do you plan to record again in the future? I will before too long go back to the keyboard because there are still plenty of songs to put down as best I can at home. There are loads of songs already written too, which are good enough to record, as well as unfinished things. Do you ever plan to return to the studio with a band? I know that is something which both the Tomorrow band and Ray Russell would like to do. It’s just so much easier and convenient to carry on with what I’m doing with the keyboard. I would consider it, but there are no plans for anything like that at the moment. It might be possible to collaborate a bit more though. Tomorrow Tomorrow and Tomorrow ends with one of my favourite songs Isles of Sleep and the line “Nothing has changed, only me, the worlds still the same, but I’m not the same.” Are you still changing? Still searching? Or have you reached a level of contentment? The level of contentment you speak off, I don’t think exists. I don’t think you can be content when there is so much wrong in the world. I think you do have to strive to keep awake to all the things I was talking about earlier. Nature will always inspire me, it’s great just to see a robin sometimes, there are such miraculous little things in the world. In day-to-day life you can quite easily become not as connected as you have been in the past, so there is always a feeling within me that I need to stay awake to the full picture, no matter what the distractions. 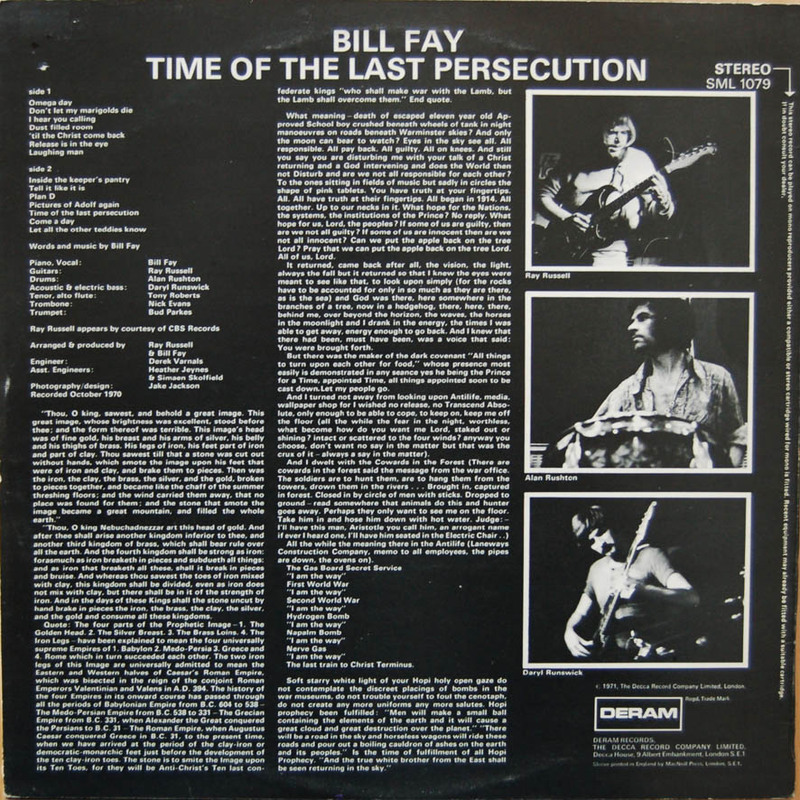 Thanks for posting the two pieces on Bill Fay. The interview was a satisfying read. I’m also glad you noted the wonderful “Isles of Sleep.” That is one song so good, yet so fragile, that I make efforts to limit its play. Listening is best with headphones, late at night when time quiets and the mind can contemplate the mysteries of life. The slight pause Fay holds before completing the last line is devastating, a true treasure.